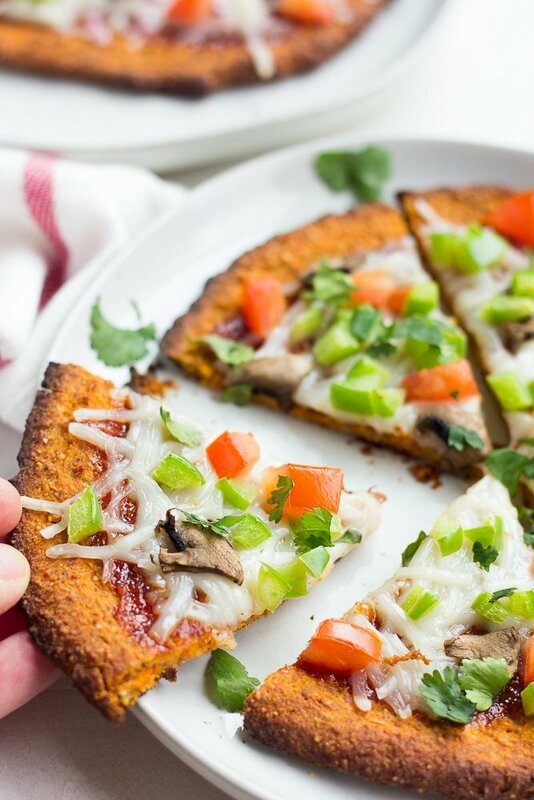 Super simple Sweet Potato Pizza Crust that is both vegan and gluten free! 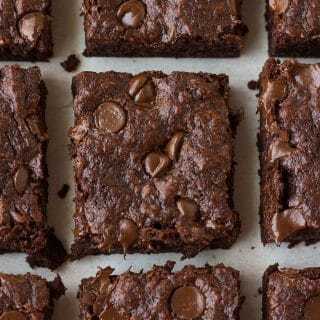 Made with only 5 ingredients, and ready in about 30 minutes. You won’t believe how delicious this is until you try it! Pizza lovers rejoice! 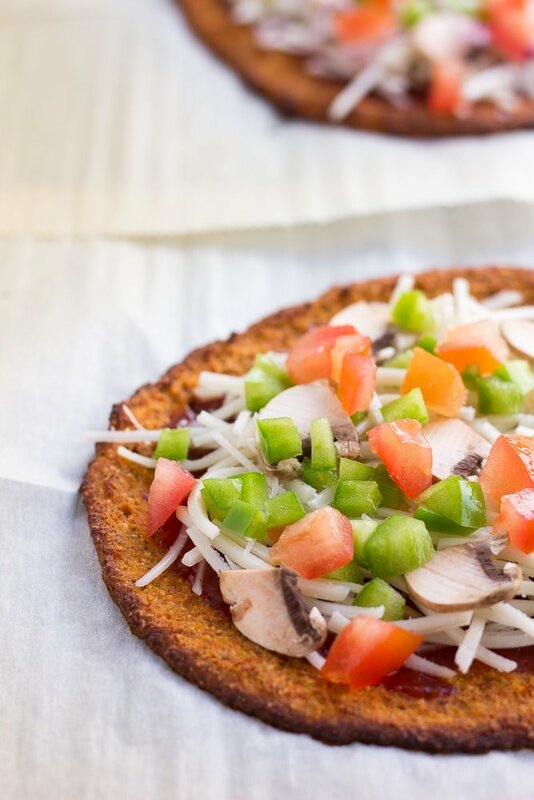 This sweet potato pizza crust is surprisingly tasty and really easy to make. It’s made with just 5 wholesome ingredients: Cooked sweet potatoes, almond flour, cornstarch OR arrowroot, ground flaxseeds and salt. 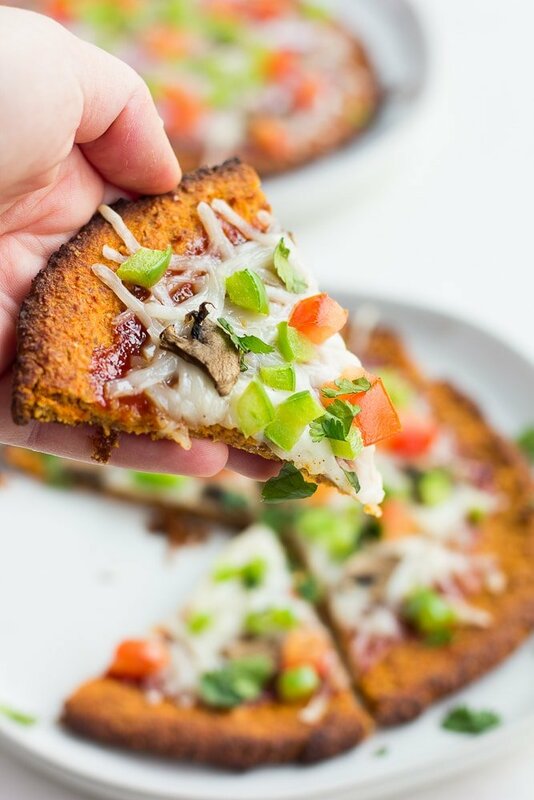 I first saw the idea for sweet potato pizza crust on Pinch of Yum. Their recipe is made of grated raw sweet potatoes, oats and eggs. So I went a different direction, played with the ingredients, ended up using cooked & mashed sweet potatoes, and created a recipe that is vegan, gluten free and as simple as possible to make. I seriously wasn’t going to post this recipe if it tasted like diet food, or anything less than absolutely yummy. But thankfully, it worked out so well, and I’m super excited to share it with you! 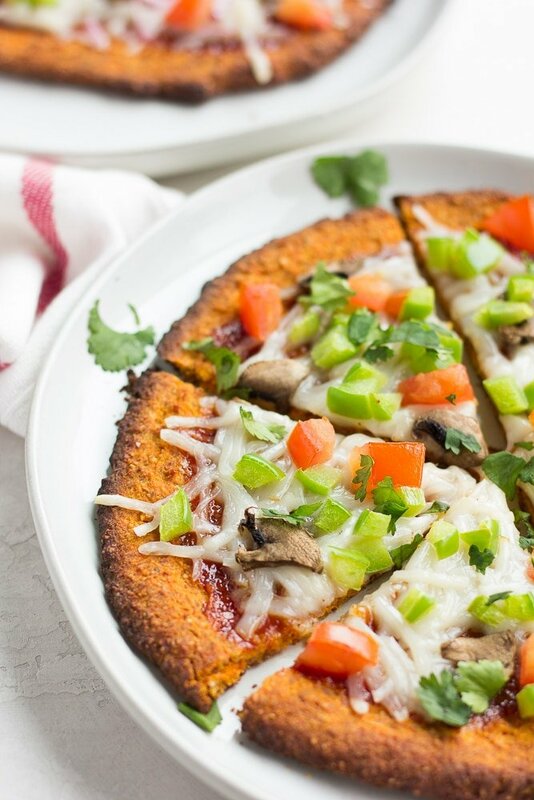 How do you make Sweet Potato Pizza Crust? First, you need to cook your sweet potatoes. I recommend doing this the day before, or on the weekend, and keep the cooked sweet potatoes in your fridge until ready to make the pizzas. This way, you can whip up the pizzas in about 30 minutes! 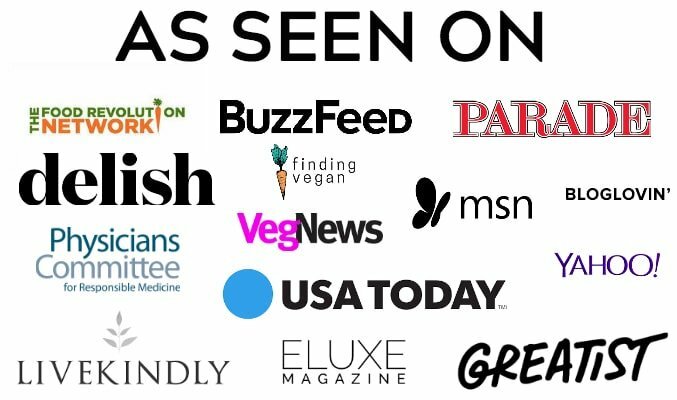 INSTANT POT —> This is what I did. Place the steamer basket in Instant Pot and add 1 cup of water. Place the sweet potatoes, whole, on the basket, close the lid, seal and cook on high pressure for 15-18 minutes. Allow pressure to release naturally, then remove sweet potatoes and let cool a bit. OVEN —> Bake whole sweet potatoes at 425 degrees F for about an hour, until very soft. When the cooked sweet potatoes are cool enough to handle, scoop out the flesh, mash and measure 2 cups. Add this to a large bowl, then add the other ingredients and stir until well combined. 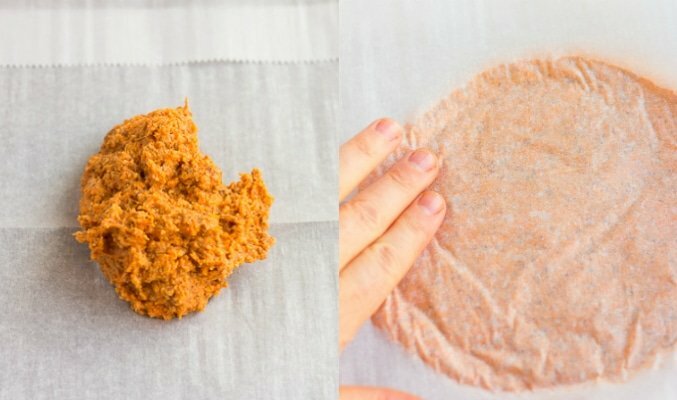 Using another piece of parchment paper, press it down evenly into a circle with your hands, until it is about 6 inches in diameter. It doesn’t have to be perfect. Peel off the top layer of parchment paper, carefully and gently. Bake the pizza crusts at 425 degrees F for about 20 minutes, then remove and add toppings. I topped my pizzas with barbecue sacue, daiya vegan cheese, green peppers, tomatoes, mushrooms and then sprinkled some cilantro on top when they were done. SO GOOD. Top them with whatever you like, such as regular pizza sauce, any veggies, maybe my Stretchy Mozzarella, Vegan Pepperoni, or try Hawaiian toppings like this Hawaiian BBQ Pizza. Place the pizzas with toppings back in the oven for 10-12 minutes, then serve hot! If you have leftover pizzas, I would re-heat them in the oven for best flavor and consistency. You could pop them in the microwave, but they will be a little soggy. Pop them in the oven at 425 degrees for 10 minutes until warm. 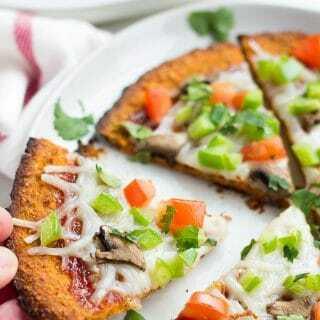 Sweet potato pizza crusts also freeze well! Simply cook the crusts for 20 minutes, let them cool, place them in a freezer bag, perhaps with a small square of parchment paper in between them, and freeze. When ready to use, remove from freezer, pre-bake in the oven for about 10 minutes at 425 degrees, then add your toppings and bake for about 10-12 minutes. 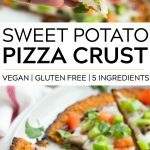 Super simple Sweet Potato Pizza Crust that is both vegan and gluten free! 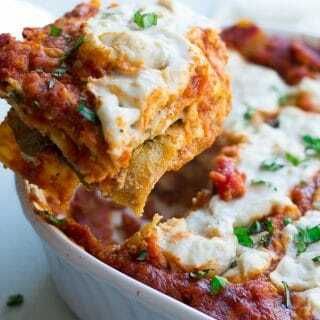 Made with only 5 ingredients, and ready in about 30 minutes. 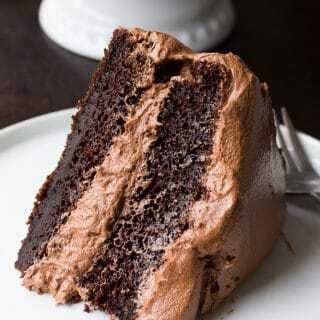 You won't believe how delicious this is until you try it! Bake the sweet potatoes in the oven (425 degrees) for about an hour, until very soft and cooked through. I used my Instant Pot, with the steam rack and 1 cup of water for 18 minutes. Once the sweet potatoes have cooled enough to handle them, scoop out the flesh, mash and measure 2 cups. Add sweet potato puree to a large bowl. 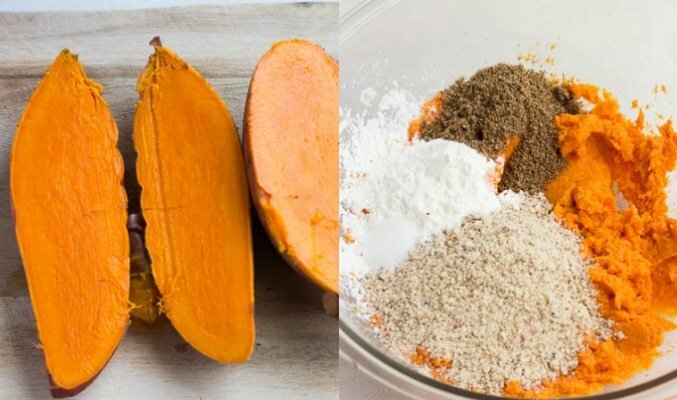 To the bowl with the sweet potato puree, add the almond flour, cornstarch or arrowroot, ground flaxseeds and salt. Mix well with a spoon or fork until well combined. Preheat the oven to 425 degrees F and line two baking sheets with parchment paper. Take about 1/2 cup of the dough and place it on one side of the parchment paper lined pan (you will have 4 crusts total). 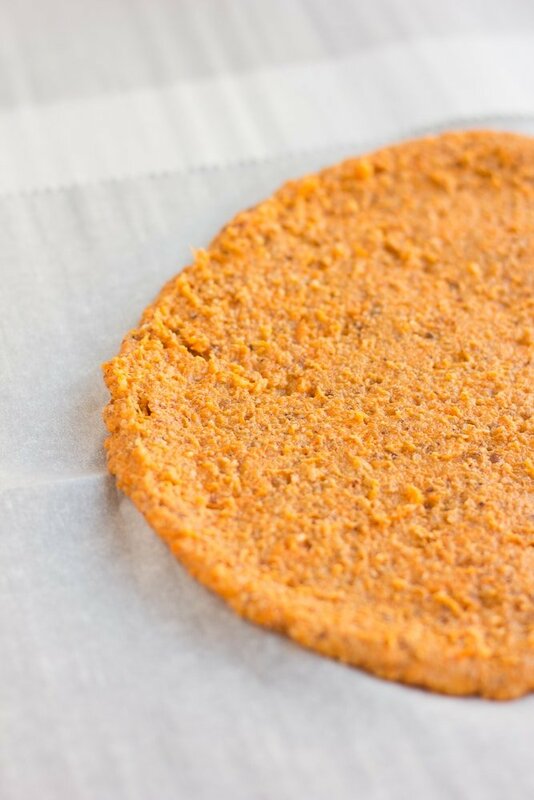 Use another piece of parchment paper to press it down and roll it into a circle with your hands, about 6 inches in diameter. Peel off the top layer of parchment paper, gently. Repeat the process until you have 4 crusts. The dough will be very mushy and soft. That is okay, once it bakes it will firm up and come off the parchment paper just fine. Bake for about 20 minutes. Depending on how thin your crusts are, you may need a few minutes less or more of baking time. Remove from the oven, top with sauce, vegan cheese, vegetables or anything else you like and pop back in the oven for 10-12 more minutes. Remove from the oven and serve hot. Enjoy! May also use almond meal in place of almond flour. Either one works just fine! I haven't tried this with white potatoes, but I suspect it would work. For a nut free option, replace the almond flour with oat flour.